Near to the end of the story that starts with stars exploding in the Galaxy and ends with extra clouds gathering, a small but important paragraph was missing till now. From experiments in Copenhagen reported in 2006 and reconfirmed in 2011 in Aarhus and Geneva (CERN, CLOUD), cosmic rays coming from old supernovas can indeed make molecular clusters a few millionths of a millimetre wide, floating in the air. But can these aerosols really grow nearly a million times in mass to be large enough to become “cloud condensation nuclei” on which water droplets can form – as required by Henrik Svensmark’s cosmic theory of climate change? Opponents pointed out that theoretical models said No, the growth of additional aerosols would be blocked by a resulting shortage of condensable gases like sulphuric acid in the atmosphere. In the limelight of the atmospheric drama, sulphuric acid is one of the commonest of trace gases and very important for both the formation and the growth of aerosols. When the Sun rises in the morning, its ultraviolet rays convert sulphur dioxide, ozone and water vapour in the air into sulphuric acid molecules. These are continuously lost as they club together with further water and a little ammonia into very small molecular clusters. Nevertheless, the concentration of sulphuric acid rises to a peak and then diminishes as the Sun goes down in the evening. A clue that something more is going on comes from the persistence all through the night of sulphuric acid at about 10 per cent of the daytime maximum. If these molecules too are continuously lost, they must be replenished by a chemical reaction that doesn’t need ultraviolet light. What did the new experiment called SKY2 show? Without going into technical details that you’ll find in the paper, let’s just say that the primary result flatly contradicts the theoretical prediction that the infant aerosols couldn’t grow up into cloud condensation nuclei. Here’s a figure from the paper. Molecular clusters grow over time, in the SKY2 experiment in Copenhagen. The horizontal axis is scaled in nanometres (millionths of a millimetre) and each blue point shows the relative number of clusters of that size before and after the experimental runs. Anything over 1.0 means that growth has continued. 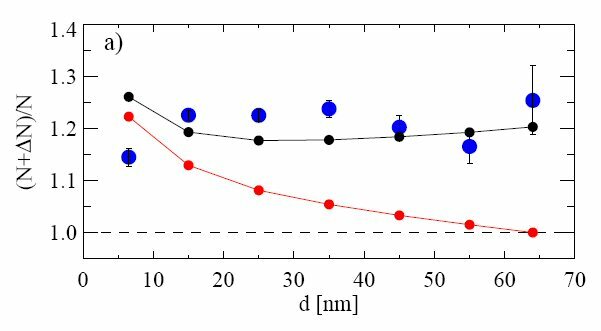 In contrast, the red points illustrate a pessimistic prediction of previous theories, that growth should cease when the size passes 50 nanometres. On the other hand, the black curve running through the blue points shows what is to be expected if there is a continual supply of sulphuric acid. The persistent growth of clusters occurs only in the presence of gamma rays that simulate cosmic rays and set electrons free to influence the chemistry. So what’s the explanation? What new pathway supplies the sulphuric acid needed to keep the growth going? The Danes recall a suggestion in their 2006 SKY report that electrons can act like catalysts, being used over and over again to promote chemical action. In the new paper they say: A possible explanation could be that the charged clusters are producing additional [sulphuric acid] molecules from reactions involving negative ion chemistry of [ozone, sulphur dioxide and water], where a negative ion can be reused in a catalytic production of several [sulphuric acid molecules]. Depending on the concentrations of trace gases, several may mean dozens. And where do the electrons come from? They are liberated by cosmic rays raining down by night as well as by day. If the results of the experiment and these ideas are confirmed, there’s an amazing pay-off. The cosmic rays help to make the extra sulphuric acid that allows (1) a number of additional aerosols to form and (2) a larger number of aerosols to grow into cloud condensation nuclei. Without this second effect the aerosols would grow slowly and most of the extra aerosols would be lost before becoming large enough to seed clouds. That ions liberated by cosmic rays promote a second pathway for forming sulphuric acid was already known from an experiment performed in Copenhagen in a collaboration with the University of Copenhagen and the Technical University of Tokyo (see the Enghoff et al. reference below). Depending on whether the sulphuric acid comes from ultraviolet action or is ion-induced, it has different signatures in the relative abundances of isotopes of sulphur. What’s more, the number of molecules made by the ion route greatly surpassed the number of ions available, again implying reuse of the electrons in a catalytic fashion. In experiments where ultraviolet light produces aerosols from trace amounts of ozone, sulphur dioxide, and water vapour, the number of additional small particles produced by ionization by gamma sources all grow up to diameters larger than 50 nm, appropriate for cloud condensation nuclei. This result contradicts both ion-free control experiments and also theoretical models that predict a decline in the response of larger particles due to an insufficiency of condensable gases (which leads to slower growth) and to larger losses by coagulation between the particles. This unpredicted experimental finding points to a process not included in current theoretical models, possibly an ion-induced formation of sulphuric acid in small clusters. Scandals of a political character engulf climate physics these days, but future historians may shake their heads more sadly over scientific negligence. Isn’t it amazing that such a fundamental activity of sulphuric acid, going on over your head right now, has passed unnoticed since 1875 when cloud seeding was discovered, since 1996 when Svensmark found the link between cosmic rays and cloud cover, and since 2006 when the Danes suggested the catalytic role of electrons? Perhaps the experts were confused by the ever-present dislike of the role of the Sun in climate change. Supernova remnants → cosmic rays → solar modulation of cosmic rays → variations in cluster and sulphuric acid production → variation in cloud condensation nuclei → variation in low cloud formation → variation in climate. Svensmark won’t comment publicly on the new paper until it’s accepted for publication. But I can report that, in conversation, he sounds like a man who has reached the end of a very long trek in defiance of continual opposition and mockery. Henrik Svensmark, Jens Olaf Pepke Pedersen, Nigel Marsh, Martin Enghoff and Ulrik Uggerhøj, ‘Experimental Evidence for the Role of Ions in Particle Nucleation under Atmospheric Conditions’, Proceedings of the Royal Society A, Vol. 463, pp. 385–96, 2007 (online release 2006). This was the original SKY experiment in a basement in Copenhagen.